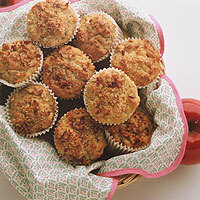 Homemade muffins make a wonderful gift or addition to a holiday brunch. Crack whole walnuts carefully, and use the shells to house tiny presents. Preheat oven to 350°F (175°C). Lightly oil muffin tins or line with paper muffin liners. Put flours, cornmeal, baking powder, baking soda, salt, cinnamon and cloves in a large mixing bowl; stir and set aside. Place dates and hot water in blender or food processor and blend until smooth. Add juice, yogurt, bananas, syrup, oil and vanilla extract; blend again. Add eggs and cranberries and pulse for a few seconds, just long enough to break up cranberries. Add wet ingredients to dry mixture. Fold in grated apple and walnuts and gently mix together using a minimum number of strokes. Fill muffin cups to top with batter. Bake 25 to 30 minutes or until a toothpick inserted in the center comes out clean.